Four environmental NGOs on Thursday sued the French government for failing to uphold its commitments on fighting climate change, the latest in a series of high-profile cases that aim to force governments around the world into action. The foundation of Nicolas Hulot, a crusading former environment minister who quit President Emmanuel Macron's government last year over what he saw as its failure to green the economy, has teamed up with Oxfam, Greenpeace and "Notre Affaire A Tous" (It's Everyone's Business) in taking on the state. Over two million people have signed a petition backing the move, which follows similar cases lodged in the Netherlands, Pakistan and Colombia that yielded historic wins for campaigners. Despite Macron's promise to "make our planet great again", France's emissions in 2017 exceeded its commitments under the 2015 Paris climate treaty. "We waited a long time for a response from the government but it has announced no new far-reaching measures," said Marie Pochon, spokeswoman for Notre Affaire A Tous. "It seemed natural therefore to launch this lawsuit." The government defended itself in a reply to the NGOs in February, saying that measures taken to date were "starting to produce results". Environment Minister Francois de Rugy told a parliamentary channel on Thursday: "I understand that people want things to go faster and further on climate change, me and President Macron among them." But he argued, "no court will reduce greenhouse gases. It's a political matter first and foremost." 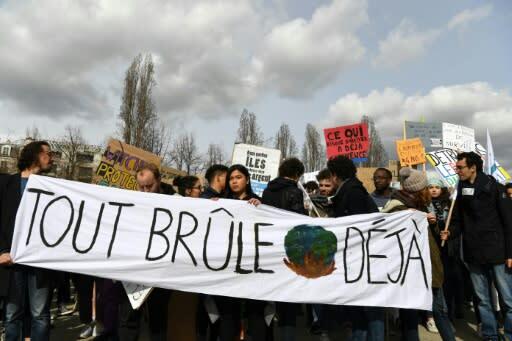 The lawsuit filed in a Paris court asks that the government be found guilty of "failings" on climate change and forced to take corrective action. The Netherlands was one of the first countries to rule on a climate case in 2015, with a court ordering the state to reduce national greenhouse gas emissions by at least 25 percent by 2020 compared to 1990 levels. The ruling was held up as a model by climate campaigners and spawned similar cases around the world. A court in Pakistan, which has been repeatedly hit by deadly floods, sided with a young farmer who sued the government for neglecting to tackle the impact of climate change on owners of farms. And in Colombia, a group of 25 young campaigners won a historic victory last year when the Supreme Court ruled that they had a right to a healthy environment and that the Amazon rain forest had a "right" to protection. Hundreds more such cases are winding their way through the courts in over two dozen countries, according to the UK-based Grantham Research Institute on Climate Change and the Environment. But campaigners are not putting their trust in the courts alone. On Friday, young people around the world are being urged to take part in a school strike for climate change, spurred by the weekly protests launched by Swedish schoolgirl Greta Thunberg six months ago. Further demonstrations are also planned for Saturday in France.